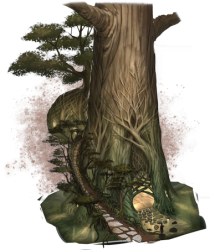 The Wood Elves or the “Bosmer” hail from Valenwood in the South-Western Tamriel. The Bosmer have chosen to live their lives in the wilderness among nature. The Wood Elves are quick and agile, arguably the best archers in all Tamriel. It is also no surprise that the Bosmer have developed an increased resistance to diseases and poisons. Combine these qualities with the naturally developed ability to move unseen, the Bosmer make excellent thieves and scouts. In Elder Scrolls Online, the Wood Elves have an increased experience gain rate with the bow skill line and their stamina regeneration rate is increased in combat thanks to the passive racial skill Vigor. The Wood Elves also have a bonus to poison and disease resistance and increased maximum Stamina, a racial skill called Resist Affliction. The last racial skill, Stealthy, increases the stealth radius and damage done by stealth. The Wood Elf racial skills focus on stamina and stealth. The Wood Elf is a natural choice for those who enjoy playing the stealthy assasin type in ESO.